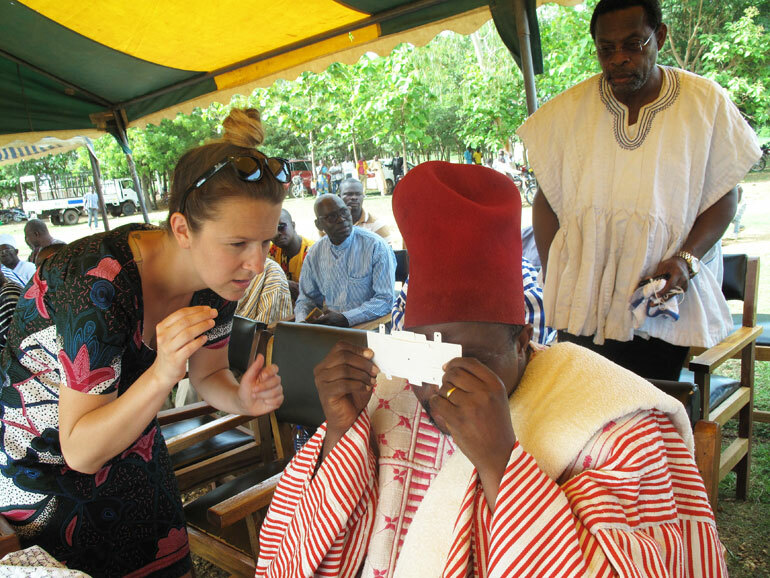 UBC Faculty of Education’s Carly Bokor shows Paramount Chief of the Nabdam Region how to use the Foldscope. And thanks to teachers with UBC Okanagan’s Faculty of Education, that change has made its way into West Africa. When Stanford researcher Manu Prakash invented the Foldscope, he shared his technology via TED Talks. His talk, titled A 50-cent microscope that folds like origami, was viewed 1.7 million times. One view in particular has proven to have changed a small part of a big world—in a microscopic way. Fast forward after that one view. UBC Okanagan Faculty of Education (FoE) Associate Dean Susan Crichton and PhD student Cindy Bourne boarded flights to West Africa, along with ten UBC students and 100 folding microscopes supplied by Foldscope. Building on a five-year partnership with the Nabdam School District in Upper East Ghana and Uganda’s Arua Core Primary Teacher College in Arua, the FoE’s goal is to put Foldscope technology in the hands of Ghanaian educators. Bourne and student alum Connor Pilling led a group of UBC students through a series of Foldscope workshops with local educators. While the partnership evolves each year, the overarching goal is to provide sustainable and culturally-relevant value, explains Bourne who leads the program each year as part of her PhD research. The Foldscope was the perfect next step in creating teaching resources in challenging contexts. Foldscope agrees. “The UBC Okanagan program in Ghana was a natural collaboration for Foldscope, as we are looking for partners doing thorough, on-the-ground work in science education,” says Max Coyle, FoldScope community manager. Weighing in at eight-grams, Foldscope has the magnification power to spot organisms like E. coli, leishmanial donovani (organisms that infect internal organs), as well as malarial parasites. The use of the microscope has potential life-changing effects in regions like Ghana where the World Health Organization reports more than four million confirmed cases of Malaria in 2015. Through a series of workshops in Africa, UBC faculty and students collaborated with UBC alum Vida Yakong to share the Foldscope technology with African educators with the aim to offer a new lens on science education in African classrooms. Portable, durable, and cost-effective, the Foldscope—though small in size—is creating a big impact in the eyes of African educators. Crichton, in collaboration with Wachira Nichols, a professor at Aga Khan University, Institute of Educational Development, East Africa and teachers from Dar es Salaam and Nachingwea region Tanzania and Arua, Uganda released a toolkit about fostering curiosity in the classroom. Using the Foldscope for scientific discovery is one of the suggested learning resources in the toolkit. Foldscope inventor Manu Prakash has supported the project and with his help, the Faculty of Education will bring an updated model to West Africa next year. Crichton says they aim to continue to build on exploring ways to investigate infection, disease and water quality in the local environment. “Promoting access and curiosity in science and learning in challenging contexts opens up the wonders of the world to future generations of scientists,” she adds.